About two weeks ago I went to Re:Publica, a hipster event (can I say that?) in Berlin. It was an interesting event - related to the stuff I usually visit, yet different. I'll go over the differences, then present what I see as the challenge for Free Software events: get those creative, digital and always-online people closer to us! The main audience of the event could probably be best described as people interested in the 'digital lifestyle'. People who use smartphones, are always on-line. They find their places-to-go on foursquare, talk to their friends on facebook, share their opinions on twitter, Whatsapp with their love - but they don't hang out on IRC or visit forums very often and they probably have a Macbook Air and a high-end android phone. Yes, not that different from us. The event featured talks on things like the web, new cloud services like on-line music and creativity like music and video tools, open video etcetera. But that was only about 10-20%. Another 20-30% was about the future - social media, social innovation and more. To my surprise, the remaining 50% of the talks was about Freedom - and I use the capital for a reason. The Occupy movement, Digital Restrictions Management, Net Neutrality, Open Data, Digital influence on revolutions, eco-journalism, (internet) governance. 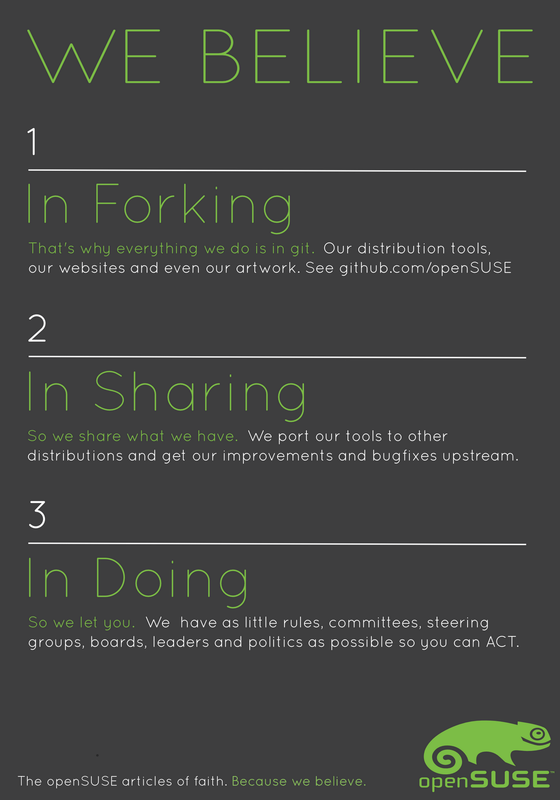 Very close to what we, the Free Software community, hold dear (and find interesting!) Yes, not so different from us. You can imagine - an event organized by hipsters creative people looks good. It does! Team t-shirts were sponsored by spreadshirt and had the title 'actionist'. There was a big wall with the program, using pictures of the speakers, QR codes and more weird stuff. A twitter stream on a screen is old, people. Here, if you tweet a hash-tag you get your face as part of a logo shape or you get a gift if you check in with foursquare. That's more like it. Oh, and they had a 'carry your own chair' program - not unlike we did at the last openSUSE conference at the end of each day, except that it was 'cool', not 'please help us out with moving chairs'! There were other things, too. Interesting or just plain weird stickers - with just a QR code or a shortened link, or only a slogan. There was stuff like a live steaming camera so you could interact with people on-line (easy to do: a laptop with a webcam connected to a google hangout?!?) and plenty of other good ideas. Surely different from what we usually do! I lately have been feeling that Free Software is loosing the battle for the hearts. Privacy and security are not important, internet is just a tool. We've been trying to educate people about Freedom but they don't care. I was wrong. Collaboration and Freedom DO matter and people know it. We just don't reach the most of those who care about these things. This is where our challenge lies! Positivism. We have a tendency to 'lecture' about the dangers of DRM, closed standards, government control and other things. Wake up! Look around you! Online Collaboration has given us Wikipedia. Online Communication has supported revolutions in the Middle East. Social Media gave us the Occupy Movement. And everyone's using Android phones. Yes, there are challenges, but let's celebrate our successes too! Relevance. We often are perfectionists. Build alternatives instead of interfacing with what's out there. But most people don't care that much for a slightly more secure system if it makes getting the latest stuff harder. People don't care about a perfectly free Cloud solution if it's more difficult or doesn't work with what they have. We must realize that a Can do attitude gets us far further than a Can't do way of thinking. And we have to make sure that what people care about is what we care about. Talking to others, sharing data, working with what's out there and checking if what we do has real-world value! At least at the conference's I'm involved in I'll be trying to broaden the audience a bit and attract people outside of our usual circle. 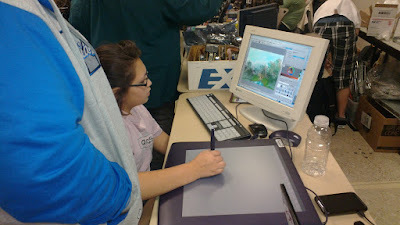 By changes to the program (workshops on Krita, Gimp, Blender, Kdenlive and Inkscape? ownCloud? web stuff? Talks about Wikimedia, the EFF, net neutrality, copyright?) and by advertising/spreading the word in less usual places (maybe an Apple fan magazine or a design paper). Let's see if we can get more people to see what we do, get involved, care! 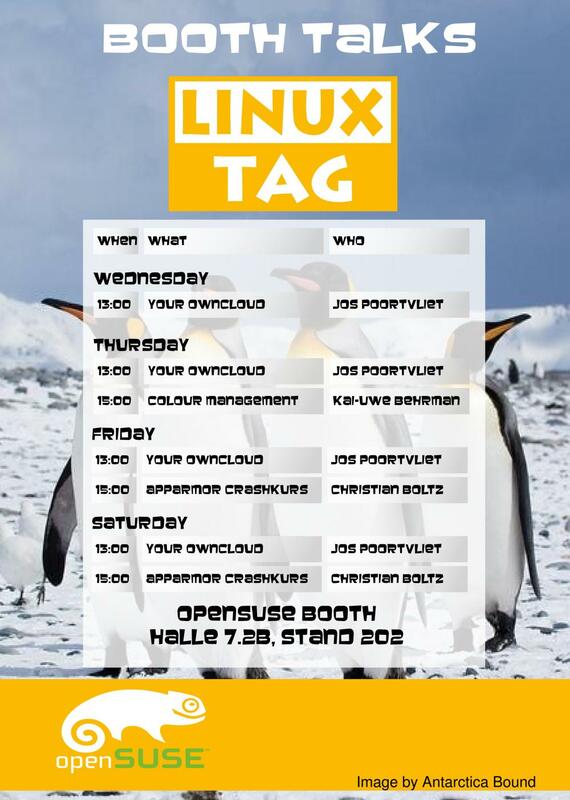 It's almost that time: in one week LinuxTag opens its doors! Courtesy of your friends at Fedora and openSUSE, there will be 'Beefy Miracle' hotdogs and 'Old Toad' beer. 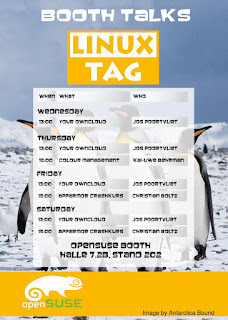 And together with the numerous other projects we bring you talks about Linux and new Free/Open Source technologies, interesting people to talk to and lots of fun and party! Cool stuff in the booth area, BEER AND HOTDOGS! 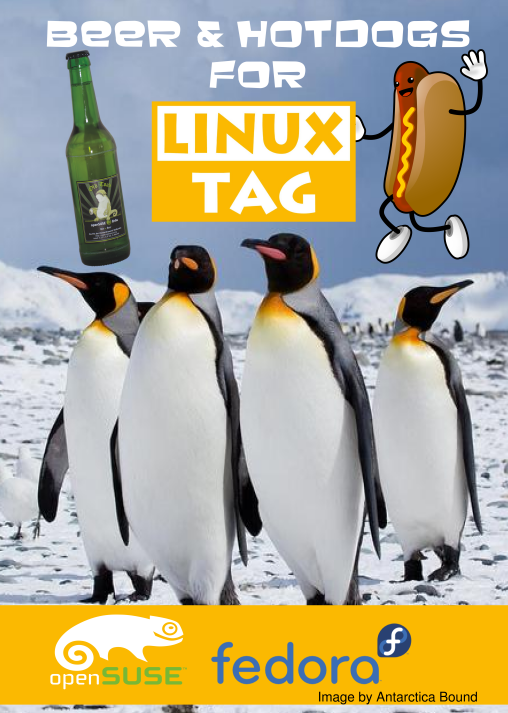 Come, buy and eat hotdogs and drink beer in support of LinuxTag! Work work! Looking for a job? 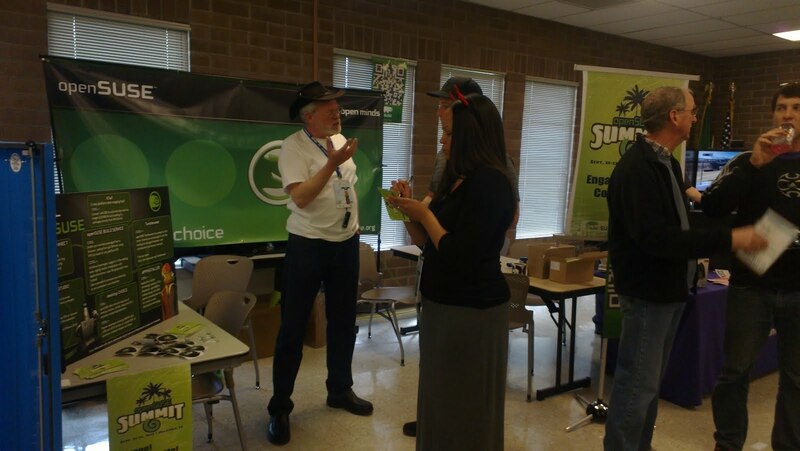 I've also heard that two HR people from SUSE will be at or around the booth during most of Friday and Saturday. We're 20 years old, still going strong and have plenty of opportunities so if you're interested in an exciting job at the greenest company in the FOSS world, ask for Johanna Grau or Nadine Pieper! 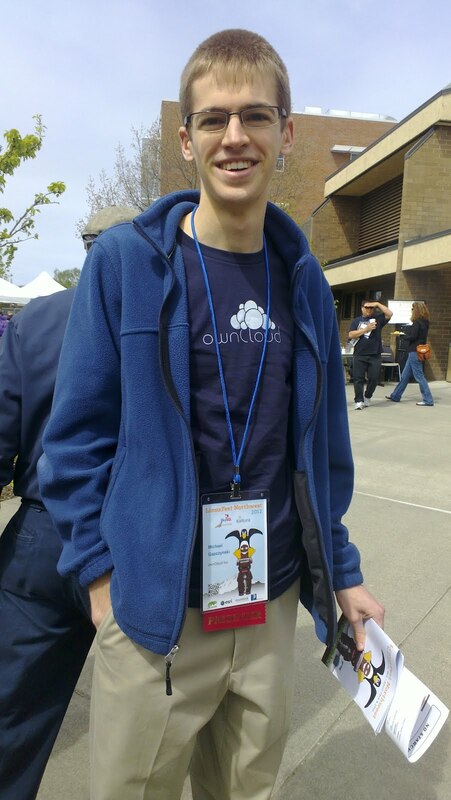 I'm greatly looking forward to seeing all the friends from various Free Software projects again, like GNOME, KDE, LibreOffice, Fedora, TuxRadio, FreeBSD and many others. And you of course, dear reader! I've been with SUSE now for almost 2 years now and it's been quite a ride. SUSE itself, however, has been having fun long before I joined. 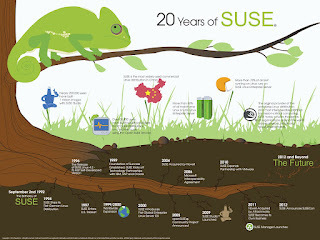 Heck, even before Free Software was on my radar (that's somewhere around 2000), SUSE was already going strong! November it'll be 20 years. Cool to see that in that time, Linux went from 'nothing' to "two-thirds of the global Fortune 100 uses SUSE Linux Enterprise"!!! Talking about careers, I know the SUSE Studio team is looking for an UI designer. If you've played with SUSE Studio you know you've got some big shoes to fill. But it is an amazingly cool project with an amazingly cool team and an amazingly cool project lead - that would be Cornelius Schumacher, or Mister President for you! The Boosters are also looking for new blood and so are many other teams in SUSE. Just have a look on this page for the job openings, about 40 at the moment. Got lots of comments on my blog "on the value of collaboration". Some positive, some less so - but that's all fine. Today I wanted to point to one thing I had in there as a link: snapper. Remember my blog about the Qt based firefox-like webbrowser Qupzilla and Fork me on Github? The new snapper website has a nice "fork us on github" button which does indeed link directly to the github repo of snapper! 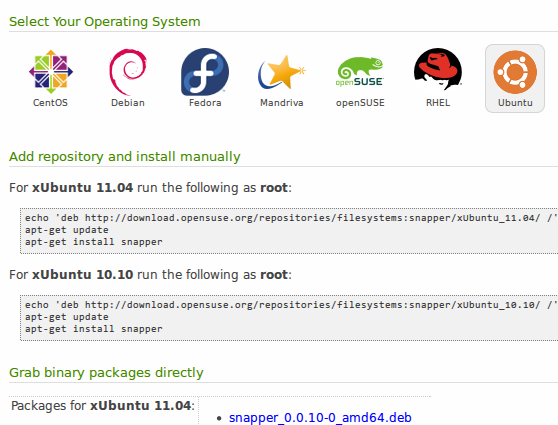 So snapper is a frontend for creating and handling the snapshots the new btrfs Linux filesystem can make. This was initially written by SUSE engineers for SLE and also made available for openSUSE - that's SLE's upstream after all. And the team thought it makes sense to make it available for other Linux distributions as well, as there's lots more interesting work to do in FOSS than re-writing tools from one distro to the other. 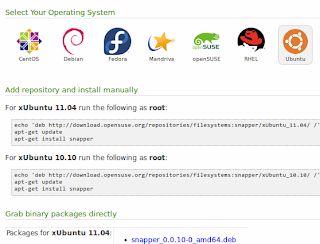 Thus right now Snapper is available for the following Linux'es: Ubuntu, Fedora, Red Hat, Debian, Mandriva and of course openSUSE. The GUI is written as a YaST plugin to make it available for commandline users as well as both on GNOME and KDE. We have ported LibYui to other distro's but I don't know if that's already enough to have the plugin create a gui on say Gentoo or Ubuntu. Help and collaboration in that area is very much welcome - LibYui is on sourceforge. So if you want snapper, get it at this link! 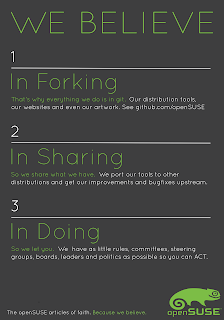 You don't have to thank us but if you have ideas for improvements and some hacking time, please think about forking github repo and of course, once things are up and running, creating a merge request!